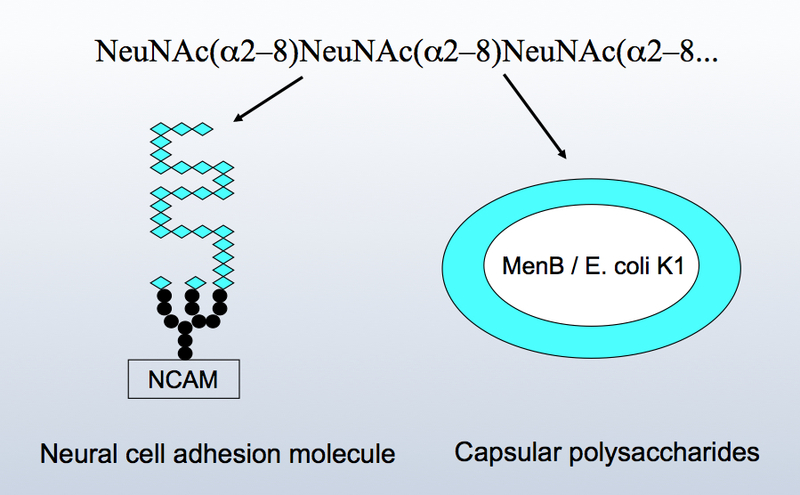 Polysialic acid is a neurodevelopmental antigen shared by the neural cell adhesion molecule NCAM and capsular polysaccharides of meningitis-causing bacteria. Polysialic acid regulates cell interactions in neural and other tissues during development, and in learning and memory consolidation. Polysialic acid has a central role in many cellular functions, such as migration, cytokine response and cell contact-dependent differentiation. Altered levels of polysialic acid are detected in various neurological diseases, as well as malignancies including neuroblastoma. The objectives of the project are to elucidate the molecular basis of the regulation of polysialic acid expression and to investigate whether polysialic acid could be used as a target for cytotoxicity of neuroblastoma cells. Meningitis-causing and other pathogenic bacteria attach to their tissue receptors by adhesin molecules binding to specific carbohydrate ligands on cell surfaces. Characterisation of these molecular interactions sheds light on the pathogenic mechanisms of bacterial diseases, and enables the development of new vaccines and new types of drugs that interfere with bacterial adhesion. We are studying carbohydrate-binding proteins to determine their interaction mechanisms and to develop inhibitors of adhesion that could be used as antibacterials. Haataja, S., Verma, P., Fu, O., Papageorgiou, A. C., Pöysti, S., Pieters, R. J., Nilsson, U. J. & Finne, J., 2018, In : Chemistry: A European Journal. 24, 8, p. 1905-1912 8 p.
Lehti, T. A., Pajunen, M. I., Skog, M. S. & Finne, J., 4 Dec 2017, In : Nature Communications. 8, 12 p., 1915. Phages crossing the border to eukaryotes: Is there a gateway for bacteriophages to get access to the interior of eukaryotic cells? Lehti, T. A. & Finne, J., 4 Dec 2017, In : Nature Microbiology. Finne, J., Vettenranta, K., Sariola, H., Porkka, K. & Lehti, T.
Skog, M., Pajunen, M., Anderson, H., Colley, K. & Finne, J.
Lehti, T., Skog, M., Lilie, H., Nacher, J. & Finne, J.